Dylan finished his championship at the tender age of 1 with 3 majors and 2 singles in 2 1/2 months . He finished his Grand Championship owner handled from start to finish. We are so proud of this boy and his puppies are just like him, tons of attitude. Dylan is out of Ch Weathermans Christmas Spirit and GrCh Ch Akadia Chandelle Steel and Flames. A big thank you to Shannalee of Akadia for the opportunity to use Kolman. Dylan is co-owned with Debbie Sirdofsky of Syringa Shelties. Dylan can now add two agility titles to his name OA and OAJ as well as his beginner novice title and his rally novice title. Love this boy!! Ryuu finished his championship at the Richland Shows in Sept 2016. He was the easiest puppy I have ever had. Ryuu tries to please you every minute of the day. Ryuu was RWD to a 5 point major under judge Charles Olvis and the next day won a 4 point major under judge Garry Newton front he 6-9 puppy class. Ryuu is out of Weathermans In Focus and GCH Ch Weathermans Syringa Free Spirit CGC ,BN,RN,OA, OAJ. He also took some time to do agility earning his OA and OAJ. 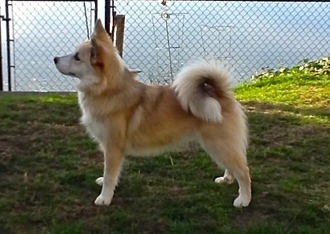 Seppi is an Icelandic Sheepdog from Snaetinda Icelandic Sheepdogs in Iceland. He is a delightful young dog who is so outgoing and happy. I cannot thank his breeders, Sunna Lif Hafporsdottir and Hafpor Snaebjornsson/Unnur Sveinsdottir enough for allowing this wonderful dog to come to the United States. Seppi got his first major toward his championship the first weekend out. He has now completed his championship finishing at the Richland shows in Sept 2016. Seppi also passed his CGC test last summer. Dutch our sweet little sable boy makes me laugh every day. He was a precious gift from Locklyn Guzman. He is funny sassy and sweet all wrapped up into one package. Dutch just recently got his 1st points in the breed ring a 3 point major, go figure funny and pretty. Our newest addition was born right here at home. He is Token's son. Guiness was born on St Patricks Day so it was only fitting that he be named after beer. Guiness is a very smart little guy that is so eager to learn. He loves going to the dog club to his puppy classes and had a ball in his first conformation show, in fact he hasn't found anything he doesn't like yet. Good boy! !